When Intel launched the Z68 Express chipset for second-generation Core family processors, one of the chipset's differentiating features was its support for Smart Response Technology (SRT), a solid-state caching technology designed to enhance overall system performance and responsiveness. SRT is not a feature specific to the Z68 Express chipset hardware, however. The technology is fully implemented in Intel's Rapid Storage Technology (RST) drivers and software (version 10.5 or newer), but it's enabled only on the Z68 Express and on newer 6- and 7-Series Intel chipsets. Smart Response Technology is a transparent caching arrangement that intelligently monitors both data reads from and data writes to a standard hard drive, caching the most frequently accessed bits of data to a faster solid-state cache to yield SSD-like performance in a system that uses a standard hard drive for its main storage volume. Solid-state drives typically offer near-instantaneous access times as well as transfer speeds that far exceed even the fastest hard-disk drives' performance. A modern SATA III SSD, for example, can deliver reads and writes in the vicinity of 550 mbps, with sub-1-millisecond access times; by way of comparison, a 10,000-rpm hard drive may hover at around 160 mbps under ideal conditions, with multi-millisecond access times. Intel Smart Response Technology can be configured to consume up to 64GB of space on an SSD. Smaller SSDs will work fine though (we tested with a 20GB model), and the extra space on SSDs larger than 64GB can still be accessed by the system. A hybrid HDD/SSD caching setup has some usability benefits. Owing to the relatively high cost of solid-state drives, PC users commonly pair a midsize (60GB to 120GB) SSD with a larger hard-disk drive, dedicating the SSD to handling the operating system and frequently used applications and data, while using the HDD for bulk storage. Such a configuration provides excellent overall performance and storage capabilities, but it requires the user to manage multiple drive letters and--if the SSD runs low on space--to move data manually from the SSD to the hard drive and back. In contrast, Smart Response Technology hides all or part of the SSD from the operating system, and it caches data automatically. No additional drive letters are necessary, and data moves dynamically to and from the SSD based on individual usage patterns. The result is a system that delivers SSD-like performance and HDD-like capacities, without the user's having to manage multiple drive letters. SRT does have some drawbacks, however. As with other SSD/HDD hybrid configurations, the data on the hard drive must be accessed multiple times before it is mirrored to the solid-state storage volume for caching purposes. 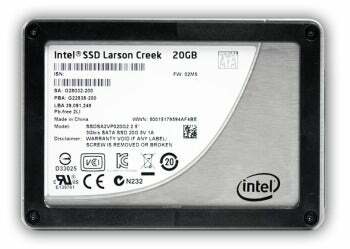 Consequently, the SSD cache offers little or no performance benefit to new or infrequently accessed data. With large file transfers, new application installations, file copies, and the like, a system with SRT enabled may perform as if it had a single, standard hard drive installed. That said, using SRT yields noticeable benefits to under most circumstances, though you may have to reinstall your system's OS to satisfy SRT's requirements. For SRT to function, your system must have a compatible chipset, the system's storage controller must be configured for RAID mode, and you must install the proper Rapid Storage Technology drivers (version 10.5 or later). If your system's storage controller is configured in IDE or AHCI mode and Windows is already in place, switching to RAID mode may result in blue screens and a nonbootable system, unless you resort to some driver and Registry trickery. Fortunately, it's easy to install and enable Intel's Smart Response Technology on a system that contains a single solid-state drive and a single hard-disk drive. First, connect both drives to the Intel-powered SATA ports in your system; then fire it up, enter the system BIOS, and configure the SATA controller to RAID mode. Restart the system and install Windows on the hard drive, ignoring the SSD for now. When the Windows installation is complete, install the drivers necessary for your system's components, including the chipset drivers and the Rapid Storage Technology (RST) drivers; you can download both at the Intel Download Center. 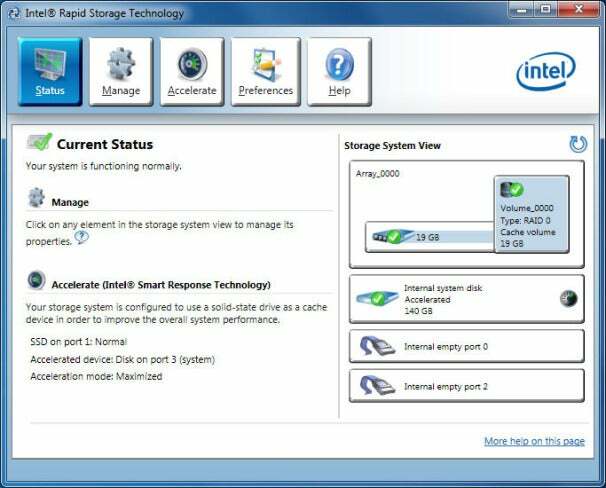 In a properly configured system, Intel’s Smart Response Technology can be enabled or disabled via the Intel Rapid Storage Technology control panel, which gets installed along with the storage controller’s drivers. Once you've installed those drivers, the system will restart, and the RST control panel will become accessible via an icon in the system tray. Double-click the RST icon, and in the resulting control panel click the Accelerate menu button; then select the SSD and specify how much storage space to dedicate to Smart Response Technology. SRT can use up to 64GB of SSD space for caching. With a 64GB or smaller SSD, you can use the entire drive and the OS will view the system as having just one drive. With an SSD of more than 64GB, you can use as much of the drive for SRT as you like (obviously, larger caches will yield better performance with larger amounts of data); and you can partition unused space on the SSD and assign it a drive letter. After selecting the SSD and defining its capacity, you can enable acceleration and choose an SRT mode. Two modes are available: Enhanced and Maximized. Enhanced is essentially a write-through cache mode, with writes speeds limited by the hard drive's performance. Maximized mode acts as a write-back cache, an arrangement that yields optimum overall performance, because it involves caching writes and then writing them to the hard drive later. How much performance can you expect to gain by using Smart Response Technology? We tested the technology on a system equipped with a Core i7-2600K processor, 4GB of RAM, a WD Raptor hard drive, and a 20GB Intel solid-state drive, all running under Windows 7 Ultimate x64. With SRT disabled, the system posted a PCMark Vantage score of 12,138. With SRT acceleration enabled, the machine operating in Enhanced mode, and the entire 20GB capacity of the SSD used for SRT, the system's PCMark Vantage score jumped to 16,563. And with SRT operating in Maximized mode, performance in PCMark Vantage increased to 16,582--a boost of about 36 percent over the system's performance without SRT. What the numbers don't convey is the speedier feel of the system. The SSD's shorter access times and quicker transfers resulted in a much snappier and more responsive system than you'd get with a hard drive alone. The difference is like night and day.